The World Oyama Karate Organization is headed by Soshu Shigeru Oyama, Founder and his brother Soshi - Saiko Shihan Yasuhiko Oyama, Founder. The World Oyama Karate International Headquarters (Honbu) Dojo is located in Birmingham, Alabama. SOSHU SHIGERU OYAMA was born in Japan in 1935 and began studying karate under Mas Oyama at an early age. He became the Saiko Shihan of Kyokushin Karate and was sent to the United States to introduce Japanese full contact Karate to the US. Fighters traveled from all over the world to train under him and he developed many world champions. In 1981, he and his brother, Saiko Shihan, founded World Oyama Karate. Soshu Oyama has published several books and videos on karate and is recognized worldwide as a top Japanese karate master. He has fought the legendary 100 man kumite, winning 100 consecutive fights with black belt opponents in a single day. Soshu Shigeru Oyama is a 10th degree black belt and the Executive Committee Chairman of World Oyama Karate. SOSHI - SAIKO SHIHAN YASUHIKO OYAMA began training at Mas Oyama's Dojo in 1958. He was considered an exceptional fighter by Mas Oyama. Saiko Shihan is an All-Japan Full-Contact Champion and a has published many books and articles about karate in Japan. He has conducted seminars and demonstrations all over the world, amazing audiences with his use of the bo and tonfa. Saiko Shihan Oyama is a 9th degree black belt and the Founder and Director of World Oyama Karate. SHIHAN TAKESHI SAITO is a 5th degree black belt of World Oyama Karate. He spent 5 years at the Headquarters dojo in New York City as an "Uchi-deshi" to Soshu Oyama, teaching classes and studying under his direct supervision. He moved to San Francisco to spread World Oyama Karate to the West Coast. 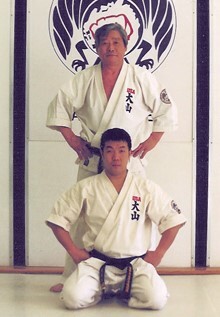 Shihan Saito opened the San Francisco Dojo in September 2001.